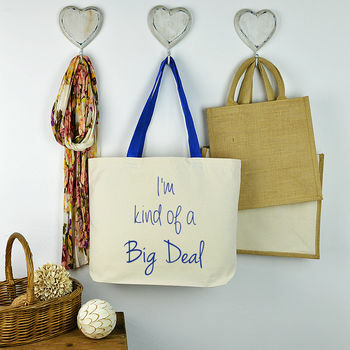 Our 'I'm Kind Of A Big Deal' bag, is the perfect shopping bag with plenty of space inside for all your bits and bobs. This large landscape shaped bag opens up into a generous size to fill with plenty of shopping. The long coloured straps are comfortable to wear on your shoulder leaving your hands free. These bags are available with handles in either Red, Blue or Pink. We will adjust the text colour according to which coloured handles you choose to purchase. These bags make the perfect gift for any occasion, Birthdays, Christmas, Easter, Mother's Day, or if you just want to treat a special family member or friend! Sponge Clean Only do not iron printed area.